Swanky Digs: How have I not blogged about this show before? Pure Design is a great show on HGTV that happens to be Canadian. Host Samantha Pynn is fantastic. I love everything she does. I also love that she focuses on green, sustainable design. Not that you would ever really know it by looking at her work - she manages to pull it off without ever sacrificing on style. It also makes me so happy to see how she reuses existing kitchen cabinets. Yes, even really bad cabinets circa 1980! 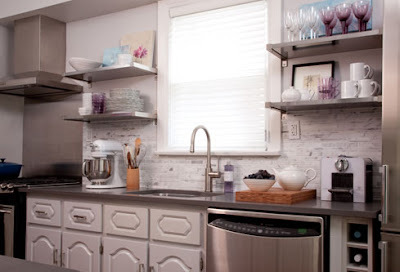 Proof that you don't have to gut your entire kitchen and spend a fortune on new cabinetry to have a fresh new space. One example is Olivia & John's new kitchen (episode 8) above. She also used the existing cabs in Colleen's kitchen reno (episode 11). You can find more examples of Samantha's stellar work here.